Let’s explore the best horror movies of 2015. The scary list features the usual mix of reboots (‘Victor Frankenstein’), sequels (‘Insidious: Chapter 3’) and original fare (‘Krampus’). We’ve got cannibals (‘Green Inferno’), heavy metal demons (‘Deathgasm’) and Skype ghosts (‘Unfriended’). It’s a versatile year. Based on me watching almost everything released, these are the top 25 best horror movies 2015 has provided. Let us know in the comments what your picks are. -Seen It- As a zombie apocalypse erupts, a talented mechanic sees his family killed, and his sister kidnapped by a team of gas mask wearing soldiers. He hits the road to find her in his blood-powered armoured car, teaming up with a loud-mouth aborigine and encountering various rough and ready survivors as he battles through the flesh-eaters in the harsh bushland. Meanwhile, his sister is being experimented on by a psychotic doctor, working toward giving her the ability to control zombies with her mind. 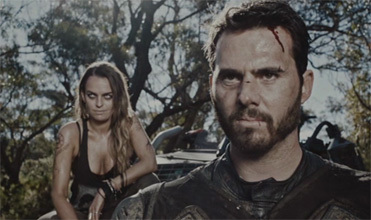 By the time her brother arrives, she may not need his help… This is a micro-budget zany Australian horror that aims to mix ‘Mad Max’ with ‘Dawn of the Dead’. Filmed on weekends as a labour of love over the course of several years, it’s a big achievement what they managed to accomplish, but a hard one to universally recommend. Essentially it’s a 14 year old’s definition of an awesome movie, with crazy guns, blood packs, fast cuts, swearing and zaniness. It’s also a one-dimensional movie with a thin script, thin characters, and Syfy-quality zombies. Compare it to the similarly-influenced ‘Turbo Kid’ and it comes off poorly. How you respond to the trailer is the best indicator. 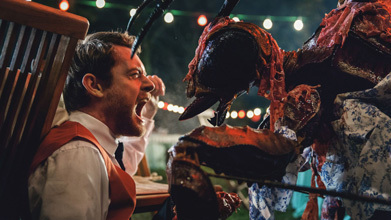 Starring: Matt O’Leary, Jessica Cook, Lance Henriksen, Clifton Collins Jr.
-Seen It- For two catering staffers, Mrs. Perch’s fancy garden party at her remote country villa is nothing out of the ordinary. Until a mishap with toxic plant fertiliser leads to the most unwelcome of dinner guests: large killer wasps… If you can get past the wasp premise (which includes stung victims having human-sized wasps hatch out of them within a minute) then this is a smart, fun creature feature. The catering-for-old-timers-at-a-country-house setting feels unique, the lead (Matt O’Leary, ‘Time Lapse’, ‘Brick’) is likeable, the humour quite well done, the mostly-practical gory fx are good and the pacing of the first hour is strong. Unfortunately it starts to sag after the wonderful Lance Henrikson (‘Aliens’) exits, and the wasps get more cgi-y as daytime rolls around. -Seen It- Sam, a troubled scout, goes on camp with a dozen other boys and three leaders, into a part of the forest where frightening rumours have originated. Those stories tell of an insane feral boy, but what’s unsaid is the boy has an even more murderous father, who has littered the woods with deadly traps. When Sam’s life in camp is made a misery by both bullies and leaders, he delves into the woods and encounters the feral boy. The two spark an uneasy understanding. But soon the father’s rampage will reach the camp, and a bloodbath will ensue… Belgian (subtitled) horror from a first-time director, sporting a synth-heavy score from Zombi’s Steve Moore. This is a pretty conventional slasher, with an interesting arc for the lead boy. The problem is Sam is too mild-mannered to convince as a deeply troubled individual. Nevertheless the setting is strong and the film is pretty fearless, going to a few places others wouldn’t. -Seen It- A bullied teenager is sent to a new-age reform center in the hills. When he starts to be picked on again he unwittingly summons the deadly spirit of a girl who died under similar circumstances. She unleashes bloody vengeance on his tormentors, before turning her murderous anger toward everyone… Although the actor does fine in the role, the lead casting is ridiculous – he’s meant to be a bullied goth teenager but instead looks 30, has model features and is gym-toned muscular. The tormented ghost looks more the part but by the end she comes off as quite whiny and more annoying than frightening. There are actually too many kill scenes – you’ll never see so much self-harm and fatal wrist slitting, which makes it a grim watch. Having said that, the central premise and kill method is a good one for a slasher (harming herself causes the injuries on her victims) and it’s done well enough. -Seen It- A wannabe writer turned teacher (Wood) starts his first day as supply at the school he used to go to. But when virus-infected chicken nuggets are served at the cafeteria, the kids turn into feral zombies, ripping apart any adult they come across. Now the bickering teachers are under siege in the school, looking for a way across the playground… This has an entertaining, edgy concept (reversing ‘The Faculty’ and playing it for laughs), with a terrific bit of casting in Rainn Wilson (‘The Office’). The twisted kid imagery is fun. However it doesn’t start well, being too silly before the kids even transform – like a weird fever dream of unnatural character moments and misfiring jokes. The tone just doesn’t work until things are well underway. Also, because this is co-written by Leigh Whannell (‘Saw’) you have his usual ego trip, meaning here the protagonist is loosely based on him and, as usual, he casts himself in the movie and is dreadful in the role. ‘Cooties’ has great pacing, and works best when the camera is on Wilson. -Seen It- A detective (Grillo) is called to a decrepit, abandoned Louisiana home to investigate the gruesome massacre of a group of amateur ghost-hunters. The only survivor found, and only suspect, is too shaken to talk until the unit’s psychologist (Bello) shows up. With the right questions it all starts coming back… Produced by James Wan, based on his story, this is from the director of decent frat thriller ‘Brotherhood’. It combines found footage, interrogation video, news cameras and classic cinematography. It heavily rips off ‘The Usual Suspects” plot structure, but actually it’s that approach which makes it many times more effective than if the same story had been told in a linear way. Grillo and Bello are seasoned pros and they do well, especially handling a handful of silly lines that would have clunked with lesser talent. While ‘Usual Suspects’ led up to an incredible ending, the last five minutes of twists here are decidely meh, it needed that bigger finish. There’s too many cuddly zombie movies. But otherwise there’s some decent looking stuff. “It Follows” looks interesting. The Krampus/evil Santa idea has been done a few times notably Rare Exports, Saint and Santa’s Slay. Krampus is a real myth that’s been told many ages ago though. In reply to Dobie – Rare Exports is a real myth told by many through the ages. Krampus is the same myth. As the other reviewer (G D SMith) said, Krampus has been done before. I havent seen Krampus yet but it would need to be extremely well done to beat Rare Exports – shame only “hollywood” blockbusters get noticed tho. Rare Exports is a brilliant movie that should have a lot more recognition. Whatever happen to the individual stalker type horror movies like Halloween, Scream? There are too many scary movies in 2015 that deal with spiritism. I don’t know why Hollywood keeps making stuff with demons, ghosts, spirits, witchcraft, and the Devil.Don’t invite stuff like this into your home or life,keep the Devil away because watching movies like that can affect a person’s thinking and an individual can become desensitized toward other people. Avoiding them protects my spirituality and well-being, also my relationship with God. Slasher films are still out of fashion, there were a few last year like ‘Stage Fright’ and ‘The Town That Dreaded Sundown’. It needs something clever like Halloween or Scream to kick off another wave and there’s no sign of that at the moment. Ghost stories are cheap to do and make good money. Especially if they’re found footage, then they’re really cheap. Have been loads of slasher films released over the last few years but they tend to be low budget and aimed at the DVD and on demand market. Blood Shed, Varsity, Blood, Chastity Bites, Bloody Homecoming, two movies called Mischief Night etc. The thing about ghost movies is that you can do them as PGs and PG 13s with lots of jump scares so the potential audience is bigger which means they are more attractive to major studios and cinema chains at the moment. I do not understand how you would think that slasher movies are good for your soul…these type of movies are terrible for your soul, and glorify murder…also these type of films will desensitize you more then any other. I’ve been watching slasher since I was a Tot. I’m a pretty sensitive dude. In fact If I got anymore sensitive I would actually become a mystical aura. Watching a horror movie about evil does not make you evil. That’s absurd. Im sure god will be alright with me watching these movies. Christians are so ridiculous. why do they have to change director for series? Insidious chapter 3 and Sinister 2 will be the best horror movies of 2015 good series both of them I love ghost stories and these are some of the best in my opion. but James Wan should still tdo them. does anyone know if the lipstick demon is going to be in this one? “Unfriended” and “Before I Wake” sound the most intriguing to me. Is a feature-length succession of static computer screen frames in “Unfriended”, which I don’t think I’ve ever seen before, going to be particularly scary? And if “Before I Wake” is the tiniest little downsized bit like unforgettable scenes from “The Cell” or “Pan’s Labyrinth”, it’s going to be a great – if quite unsettling – watch. As a fan of the gothic I think the best horror movies of 2015 will be Crimson Peak and Victor Frankenstein. Victor Frankenstein sounds like an interesting take and Daniel Radcliffe is becoming a better actor imho. This is a fantastic list of horror films…I am happy so many paranormal and haunting titles are here…I am most excited about M Night, and Del Toro releasing a new film…they are my favorite horror film directors, and it has been too long since they have released a film. Thank You for a great list! Maggie is not a horror movie. It’s a freaking painful to watch drama, that could be interpreted as a movie about some deadly disease, definitely NO HORROR in that movie. I mean seriously if you get Arnold S. to play in a so called “zombie-movie” please make it a zombie-movie and not a abstract cancer drama.. jesus.. what a waste..
A lot of choice, but Victor Frankenstein among the top horror movies of 2015? It looks like a Sherlock Holmes adventure. Mary Shelley would not be pleased. We should dig her up, pump electricity and give her the bad news. It Follows – best horror movie of 2015 so far. Yep, “it follows” is my top by far. “It Follows” has to be one of the worst horror (well, maybe of any genre) film I have ever seen. Seriously, aside from the metaphor movie from hell, what made anyone in their right mind give this first place? Good grief, not only did I want the main character to die (preferably with her leg sticking backwards), I kept praying the movie would kill my TV so I did not have to watch another second. Ugh. You know why. It’s horror for mainstream movie-going horror tourists. Since you asked, the best horror movies of 2015 are The Final Girls and Crimson Peak. Done. I’m going to be honest, I skipped to the last page after I saw that Insidious 3 somehow ended up as one of your top picks. That’s the sort of mistake that might have driven a less forgiving reader away instantly, but I was relieved to see that you picked a great number one in the end. I’m fairly positive that the sort of people who pick on It Follows just don’t really like horror that much, because it’s a well executed original concept that manages to perfectly evoke the golden era of slashers without riding on their coattails. No, It Follows detractors, “but the stupid clam shell e-reader!” is not valid criticism. Anyway, I scrolled down to your all caps “NOT GOOD ENOUGH” section and that newfound sense of satisfaction with your list was gone almost immediately. We Are Still Here, A Girl Walks Home Alone At Night, and Creep were easily some of the best horror flicks of the year. All three of those are better films than even the first two thirds of Insidious (the only redeemable part of the saga). They’d definitely make much better additions to your list than the various horror-comedies (I’ll give you What We Do In The Shadows, but are we not done with these yet? seriously?). Also, Unfriended was absolutely lame compared to the far superior The Den. We don’t need two found-footage webcam movies – frankly, I was skeptical that we’d even need one. I know this is all a matter of opinion and whatnot, but some of yours are just wrong. I’m going to guess you didn’t read what I wrote about Insidious 3. I compile this list from my experience, not what I’m ‘expected’ to like. A Girl Walks Home Alone At Night is the most overrated film of the year, decent first 15 minutes but then what a boring film.